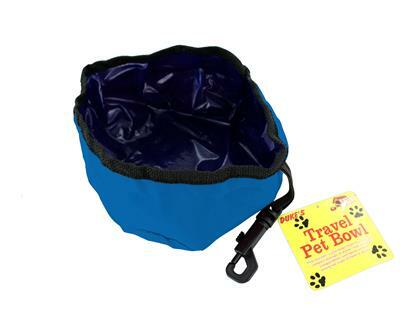 Portable and compact bowls to hold food and water for your pets while on the go. Folds into a compact bundle to easily fit in a pet survival kit. Comes in red or blue. Colors are randomly selected. Portable pet food/bowls are an essential addition to your pet's emergency supplies. These compact bowls can be stored anywhere and easily fold-out to hold both water and food. Don't be caught without a way to feed or provide your pet with water during an emergency situation.